Ramblings from My Journey as a Business Owning Techie Mom: Let's Catch Up: Product2Mkt, KidTech, Recommendations, Coupon and More! Let's Catch Up: Product2Mkt, KidTech, Recommendations, Coupon and More! Its been a while since I have blogged. So much has been going on- forgive me. A lot has happened in the past six months since 2010 began: We have the iPad now- which has spurred discussions about children and touch screen technology; a new iphone is being released (hurry up and get here! ); there are new tech toys to talk about (Vtech, Fisher Price). One bit of good news that is happening at TTS with our Stage I Keyboard is that we are being carried and distributed by Ingram Micro- not an easy feat, but one that I take much pride in. We are also going to be popping up in some Big Box Online storefronts by holiday. This is indeed an exciting time. The 2nd generation keyboard, along with the new MyTechStart website have both been very well received. http://www.mamabargains.com/ >>> Mama Bargains is a pioneer in the deal-a-day world for moms. They feature high end, awesome, must-have products for 50% or MORE off!! Please check them out. http://www.ergoguys.com/ >>> Need special peripherals? They have them! Great prices, too. http://www.tinyeinsteins.com/ and http://www.unbeatablesale.com/ >>> They have carried us for a long time now- great people to do business with! http://www.hippobargains.com/ >>>A deal-a-day site for moms, too. Great people behind the scenes!! Get a deal before its gone! Well, my ADD has taken over once again. But you knew what you were getting when you linked in to read this:). That's why my blog is called "Ramblings..." More soon. Check out our new site, http://www.mytechstart.com/, send in your photos, and let me know your thoughts. ps. here's a 40% off coupon for your time:) Use Code: MYPCBLOG. Thanks! pps. 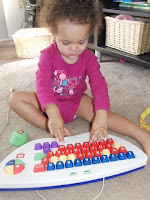 Here's our Photo of the Month>> One of my faves because it's my goddaughter, Jovie using her myPC! !